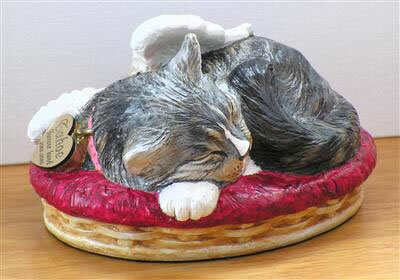 Our Custom Painted Angel Winged Kitty Urn is a cute kitty sleeping cozily with her blanket in a basket. Cast in polymer with bronze additive, this urn has amazing detail yet is lightweight and, of course, much less expensive than it would be as a sculpted bronze urn. 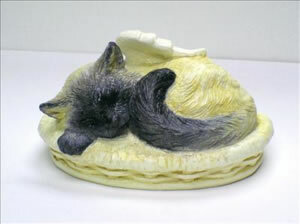 The cremains can be loaded through a 2.5 inch diameter opening in the bottom which is then closed with a plastic plug. The bottom of the urn is covered in felt to protect furniture. Please allow 2-3 weeks for our artist to complete the painting. Please upload photos to the email address on your order confirmation. Engraving is included on a heart shaped tag with a peal-off sticky backing to attach to the collar. Please limit name to no more than 10 letters and dates to years only. Measurements are 7" x 5" x 4" (25 cubic inches) for cats up to approximately 12 pounds.